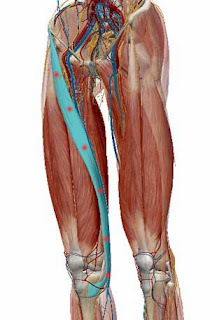 The Sartorius muscle (in Blue) is one of the lesser known muscles of the human body. It however still it plays a crucial role in knee pain and position of the pelvis and the lumbar curve. The origin of the name Sartorius arises from the word “sartor” which means tailor in Latin. Perhaps the name arose from the position that tailors sat in the old days, with their legs folded up such that the Sartorius' muscle was kept in a state of contraction. Sartorius is the longest muscle in the human body. It is a flat and thin muscle, and it has a significant amount of fascia or connective tissue in it. It is divided into several compartments, unlike other skeletal muscles. Postural implications of the Sartorius. 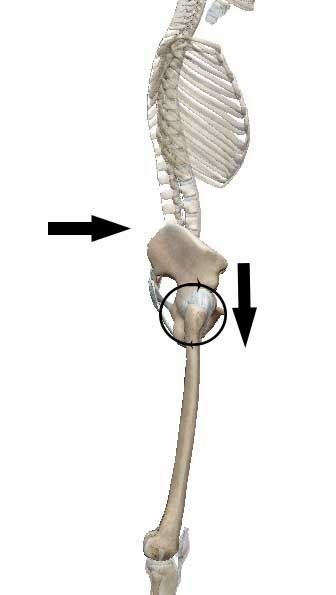 The Sartorius is a critical postural muscle and plays a crucial role in the angle of pelvic tilt. A tight Sartorius muscle pulls the Anterior Superior Iliac Spine (ASIS) downward resulting in a lordotic lumbar spine. The Sartorius connects from the medial portion of the knee and travels upward to attach to the ASIS. Tightening in the Sartorius results in stress not only in the medial part of the knee but also pulls the pelvic girdle downward front, which can cause excessive Kyphosis of the Thoracic spine and forward Head Carriage and pushes the abdomen forward. The result is lower back pain and issues with digestion, reproductive functions, and excretion due to the additional pressure on the intestine and pelvic area. It can also result in stress on the spinal column and potential impingement of the spinal nerves arising from L4 and L5. Downward, the tight Sartorius can create an inward rotation of the knees bringing them into a knock-kneed position. One can also check the condition of Sartorius by imagining that there was a direct line from the kneecap outward. If those lines point inward, then the Sartorius could be in a tightened situation. Trigger points on the Sartorius' muscle result in pain in the inner knee on the location where the muscle attaches to Tibia. Further trigger points are located all long the belly of the muscle and its path up to the ASIS. A tight Sartorius can also result in a condition called “Meralgia Paraesthetica” which is a condition describing numbness in the front and outer thigh due to nerve impingement. The most common symptom is the inability to lie on your side with your knees together as the pain in the inner knee makes this position uncomfortable. find several fire spots or trigger points (Trps) along the Sartorius as this position keeps the muscle in a contracted state. Also, a sudden extension of the hip i.e. pushing the leg back like when running without warming up can result in trauma in the Sartorius. See the locations of Trps on the image (marked in red). The Sartorius is often not the primary cause of postural imbalances...so the therapists should check associated muscle groups like such as the Quads, Psoas, and Adductors. You can sit on the floor or on a chair and palpate the muscle length to locate fire spots that generate a burning sensation. This muscle does not typically produce the same kind of pain as other trigger points. You can use double thumbs to compress and release the trigger points. Check if the spots become less tender in about 1 minute and if the points have softened. Once done proceed to stretching. First, sit in Vajrasana, then using the arms to support your weight gently fold the spine backwards till your back is flat on the ground. There should not be too much pain in this position but a light, good pain of stretching and releasing. This position works the Sartorius on both sides. If this position is too intense, then you can work them one at a time like shown here. You should feel the stretch along the entire length of the muscle. A great way to learn. analyze and fix chronic pain is to use the app called Painalog (iOS/Android). Painalog uses a 3D pain mapping algorithm to locate the exact muscles involved in your pain and then gives you exercise video solutions to both massage and stretch those muscles. Yoga shares a few qualities likewise with Buddhism that can be followed back through history. Amid the 6th century B.C., Buddhism likewise focuses on the significance of Meditation and the act of physical stances.